KARACHI – Pakistani stocks closed lower on Wednesday as investors consolidated their positions and volumes declined, brokers said. 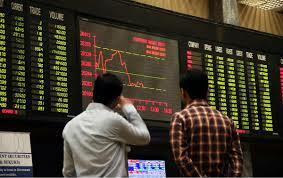 The Karachi Stock Exchange 100-share index closed down 0.35 percent or 115.93 points at 33,460.01. Engro Foods Ltd was down to 145.18 rupees, while DG Khan Cement Co Ltd was down to 136.01 rupees. The rupee ended higher at 101.55/101.65 against the dollar compared with Tuesday’s close of 101.90/101.95.